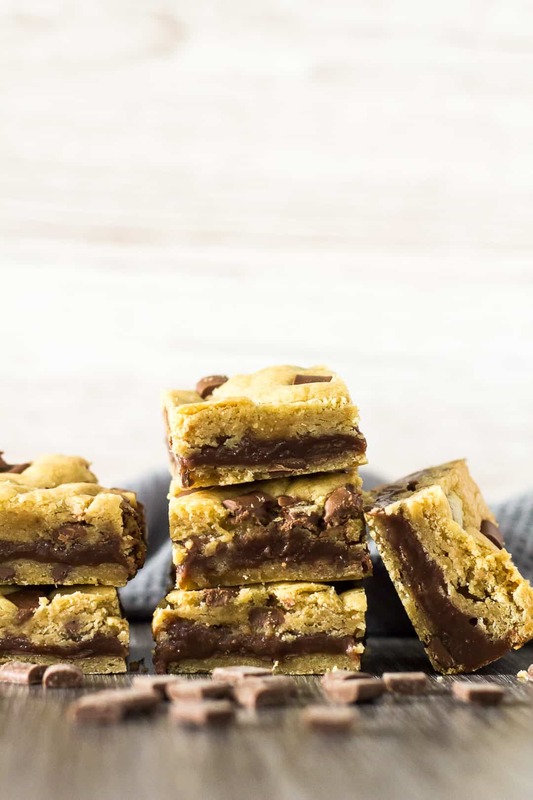 Fudge Stuffed Chocolate Chip Cookie Bars – Deliciously thick and chewy chocolate chip cookie bars stuffed with a creamy chocolate fudge centre. 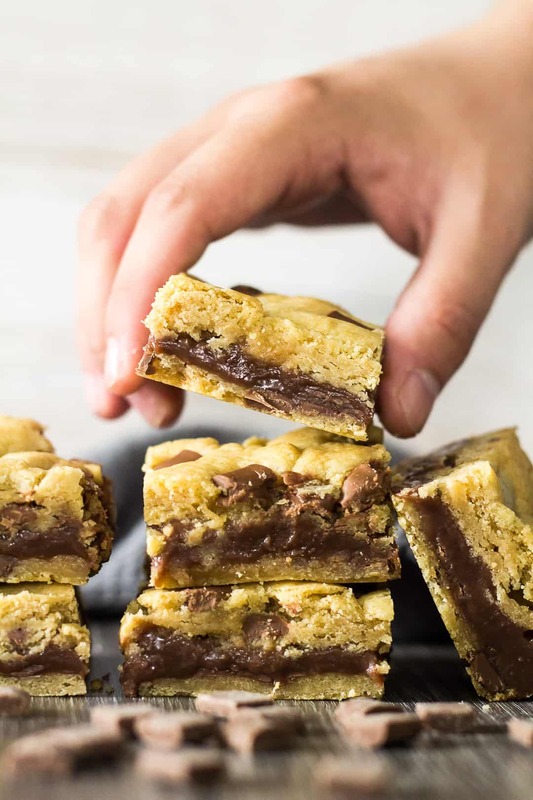 These bars take cookies to a whole new level! 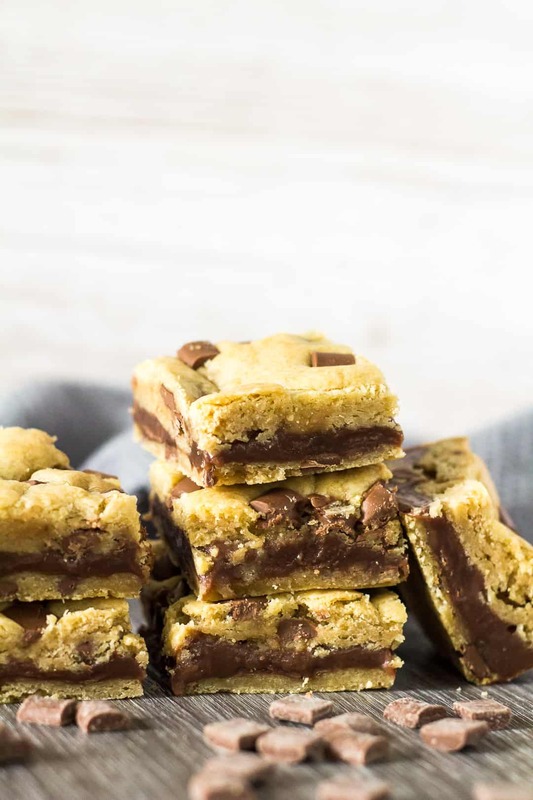 Take my favourite chocolate chip cookies and my easy chocolate fudge, combine them together, and you have these incredibly delicious chocolate chip cookie bars stuffed with chocolate fudge – perfection! Chocolate: You can use milk, dark, or semi-sweet. 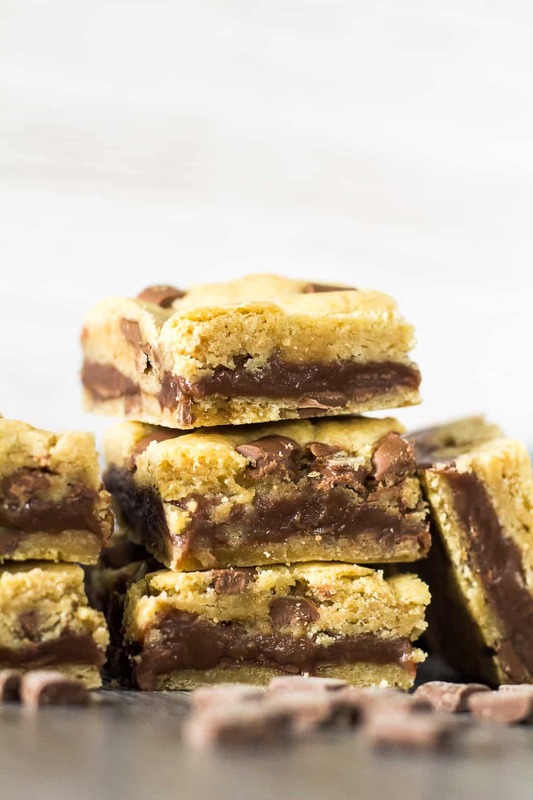 To make and assemble these cookie bars, simply make the cookie dough as instructed below. Press half of the cookie dough into an 8×8-inch square baking tray lined with foil or parchment paper. For the fudge, melt the chocolate in the microwave, then stir in the sweetened condensed milk. Pour into the pan, on top of the cookie layer, and spread out evenly. Top with the remaining cookie dough. Bake for 25 – 30 minutes until lightly golden brown. Allow to cool completely in the pan, then refrigerate for at least 2 hours before slicing into bars. TIP: As soon as you’ve removed the pan from the oven, place it into the freezer for 2 hours. This will speed up the cooling time, and you’ll get neat, clean slices! Want to make these bars ahead of time? You can make them, keep them in an airtight container at room temperature or in the fridge for up to a week, or freeze them for up to 3 months. More delicious bars to try next! 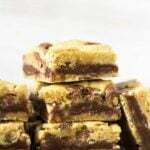 Deliciously thick and chewy chocolate chip cookie bars stuffed with a creamy chocolate fudge centre. 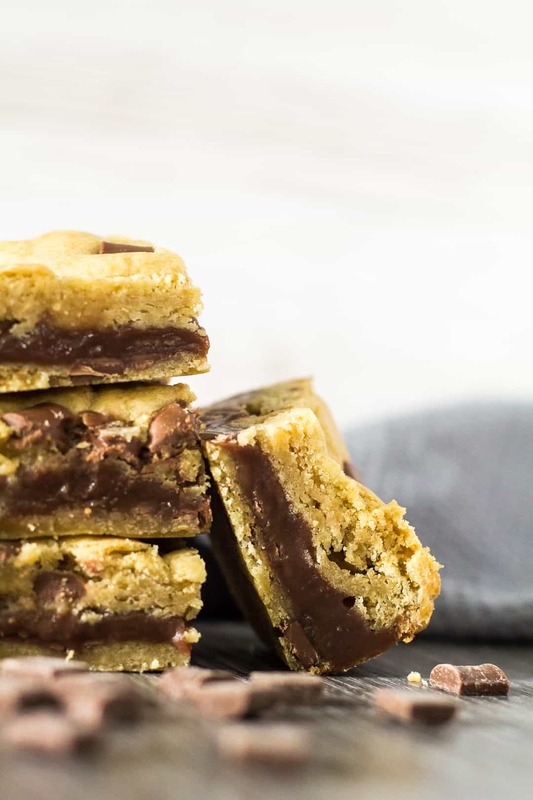 These bars take cookies to a whole new level! Place the chocolate into a microwave-safe bowl, and heat in 30 second intervals until melted and smooth. Add the condensed milk, and whisk until combined. Bake for 25 - 30 minutes or until lightly golden brown on top. Allow to cool completely in the pan on a wire rack. Refrigerate or freeze for at least 2 hours before cutting into bars. These are so totally luxe and I love that I have all the ingredients handy! Fabulous recipe! 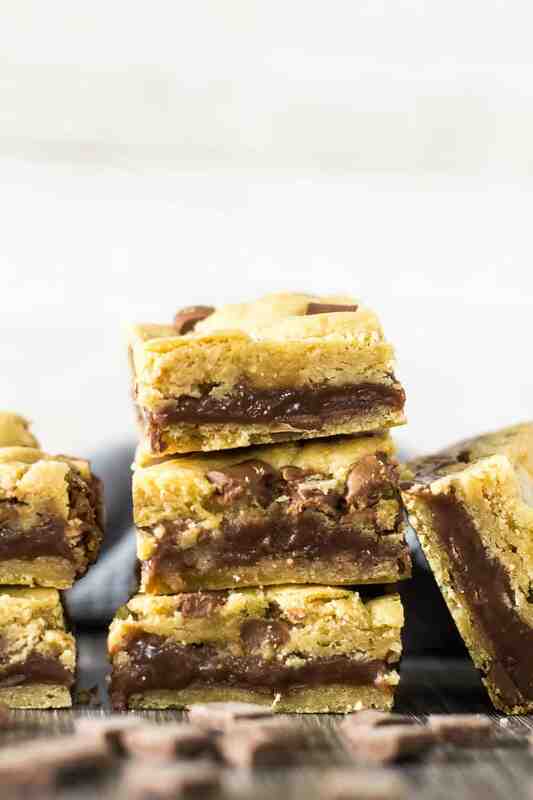 I love chocolate chip cookie bars as is, but stuffed with fudge?? omg a million times more delicious! These are awesome!! oh no Marsha! I’m keeping these beauties all to myself. Loving how melty that fudgy center looks. Too irresistible to resist.